As part of a big push to re-do my stringing paper at earlygaelicharp.info, I was searching for the reference to the tiompán with strings of “ór dearg” (red gold), which Ann Heymann refers to in her article Strings of Gold. I was pleased when I finally tracked it down, to find that the person holding the instrument is Aonghus, son of Boann and the Dagda, who lived in Newgrange, at Brú na Bóinne. This is the same Aonghus an Bhroga referred to in the praise poem to Aonghas Òig, Rì Innse Gall, which I was working on last year. There appeared to me, upon the brow of Temair / A splendid youth of noble mien / More beautiful than all beauty was his form / And his dress ornamented with gold. fogur tet a timpan sin. He held a silver Timpan in his hand / Of red gold were the strings of that Timpan / Sweeter than all music under heaven / Were the sounds of the strings of that Timpan. A wand with melody of music sweet an hundred fold / Over it [the Timpan] were two birds / And the birds, no silly mode, / Used to be playing upon it. The third verse here is the most difficult, and also the most intruiging. It seems to be describing the manner of his playing on the tiompán, but the translation as given is not very satisfactory. You can check on the manuscript facsimile at ISOS (you need to click through to f168r and look towards the bottom of the right hand column). The words are quite abbreviated and so there is some scope for alternative expansion and spacings. The key words include fleasc, (O’Curry missed out the c), often translated as “a wand”. Ann Buckley went further and translated gu cairche as “of hair”. This leads to her theory, expounded in her article “What was the Tiompán?”, in Jahrbuch fur Musikalische Volks – und Volkerkunde, vol ix, 1978, that Tiompán refers to a bowed instrument. However I am sure that Buckley is pushing things far too far here; in some unpublished notes, the eminent Celtic scholar Alan Bruford suggested instead an interpretation of these words as referring to a more impressioninstic use of technical music terms, to describe playing techniques and variation forms. Actually I get a little bored after a while of this kind of super-pedantic analysis. The text we are looking at is a deeply mythical and allegorical story, telling of the High King, Cormac, travelling from Tara down into Munster to exact illegal taxes from the people there. 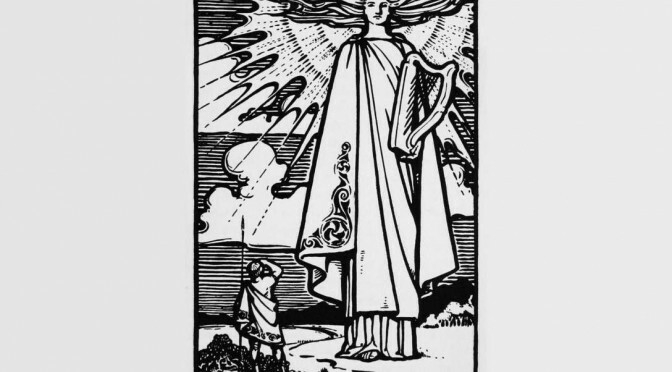 This passage is a vision of the god Aonghus, materialising at the royal palace of Tara in front of the King in some kind of dream or vision, playing otherworldly music on his stringed instrument, and prophecising to the King. I don’t think we need to take the words used in too dull and literal a sense. The author is using piles of loaded words for atmospheric, dramatic and allusory impact. 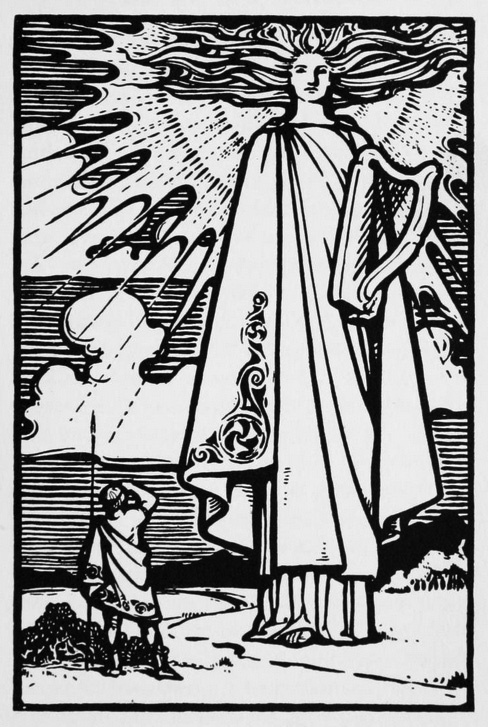 Perhaps we would do better to be like Cormac, standing in awe of this radiant immanation from the gods, marvelling at the incredibly rich appearance and imagining the sound of his faery music. The picture is from an early 20th century Irish magazine, sent to me by Terry Moylan. I am not sure what it is meant to show, but to me it looks very much like it may be Aonghus appearing in front of King Cormac! ‘As he spoke, he paused before a great mound grown over with trees, and around it silver clear in the moonlight were immense stones piled, the remains of an original circle, and there was a dark, low, narrow entrance leading therein. “This was my palace. In days past many a one plucked here the purple flower of magic and the fruit of the tree of life….” And even as he spoke, a light began to glow and to pervade the cave, and to obliterate the stone walls and the antique hieroglyphics engraven thereon, and to melt the earthen floor into itself like a fiery sun suddenly uprisen within the world, and there was everywhere a wandering ecstasy of sound: light and sound were one; light had a voice, and the music hung glittering in the air…. 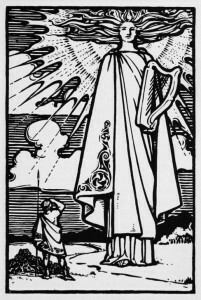 “I am Aengus; men call me the Young. I am the sunlight in the heart, the moonlight in the mind; I am the light at the end of every dream, the voice for ever calling to come away; I am desire beyond joy or tears. Come with me, come with me: I will make you immortal; for my palace opens into the Gardens of the Sun, and there are the fire-fountains which quench the heart’s desire in rapture.”’—A. E.
Very good, yes that is our man (or should I say deity). I have not paid too much attention to him in the past though there are some very good stories connected to him. It seems like the sound is a big part of his manifestation or attributes. I must look into this some more.